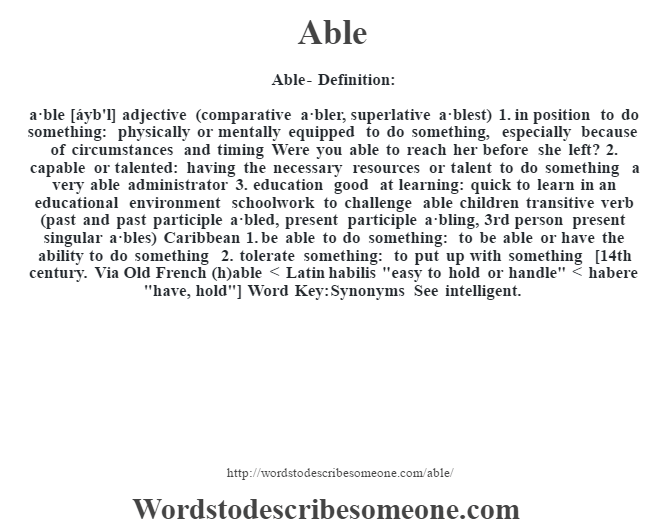 a·ble [áyb’l] adjective (comparative a·bler, superlative a·blest) 1. in position to do something: physically or mentally equipped to do something, especially because of circumstances and timing Were you able to reach her before she left? 2. capable or talented: having the necessary resources or talent to do something a very able administrator 3. education good at learning: quick to learn in an educational environment schoolwork to challenge able children transitive verb (past and past participle a·bled, present participle a·bling, 3rd person present singular a·bles) Caribbean 1. be able to do something: to be able or have the ability to do something 2. tolerate something: to put up with something [14th century. Via Old French (h)able < Latin habilis "easy to hold or handle" < habere "have, hold"] Word Key: Synonyms See intelligent.